The following is the transcript of a presentation by Dabir Tehrani given after the AGM of the UNA Edinburgh on Saturday 13 October 2012 in the Friends Meeting House, Edinburgh. Self-determination for every nation: every nation should have the right to elect their representatives toa constituent assembly whose purpose is to write a constitution safeguarding human rights as enshrined in international law. Powers of decision making based on the views of the majority, subject to protection of the human rights of all people, in keeping with the Universal Declaration of Human Rights(UDHR), and its possible future editions, which should be approved only by super-majority of the member states of the United Nations. Constitutions drafted by elected constituent assemblies, and should conform to the UDHR and International Covenant on Civil and Political Rights (ICCPR). Constitutional amendments are carried out only by a freely elected assembly and only with a super-majority (i.e., much higher than 50%, say 75%). There should be no derogation permitted of the rights as set out in the UDHR and ICCPR. Free and fair periodic and genuine elections which shall be by universal and equal suffrage and shall be held by secret ballot or by equivalent free voting procedures. Elections to be monitored by an impartial body. Absence of influence in elections by foreign governments, foreign media, multinational corporations, and the illegal financing of candidates and election campaigns. Secularism: meaning separation of religion from the State (including all its agencies) and thorough impartiality and non-discrimination by the State towards all under its jurisdiction, regardless of their religion, no religion, or belief. Politically and religiously neutral and impartial public services. Freedom of Conscience and Freedom of Expression, which includes freedom of media. Separation of powers between: the Executive, the Legislative and the Judicialbranches. Impartial and apolitical police and armed forces. These forces should not provide any privilege to any political party or religious group and should all operate under the rule of law. Equality of all before the law, except to the extent that objective differences justify differentiation. Freedom of assembly and association for non-governmental organizations (NGOs) and Trades Unions. The right to independent, self–organization of the citizens should be granted in the Constitution. There should be Constitutional safeguards to ensure that government budget deficits are maintained within specified sustainable limits. There should be mechanisms to enable people to actively participate in the democratic process. In a good democracy there should be Constitutional safeguards to ensure that government budget deficits are maintained within specified sustainable limits. Government deficit limits, such as a proportion of GDP, to be defined in the Constitution. This is to prevent any government from buying electoral popularity by acquiring excessive loans, incurring excessive expenditure, and in effect mortgaging the nation’s future. The original SGP, signed in 1997- 1999, had set the limits on government deficit (3% of GDP) and debt (60% of GDP). But with no effective means of control or method for enforcing the pact! Concerned about the effect on the stability of the eurozone, the EU commission is proposing deadlines for complying with the cap. All five – France, Greece, Ireland, Spain and the UK – already posted deficits above the 3% of GDP limit last year. Italy’s public debt rose to abound 1.9 trillion euros (approximately 120% of GDP) at the end of 2011. This compares with the agreed maximum limit of 60% in the EU’s Stability & Growth Pact (SGP)! 25 of the EU’s 27 member states have signed a landmark treaty (the “fiscal compact“) to co-ordinate their budget policies and impose penalties on rule-breakers. The Czech Republic and the UK opted out of the legally binding treaty. The current plan is for the above new Treaty, with better criteria for verifying and enforcing, to enter into force on 1 January 2013, if at least 12 eurozone countries have ratified it. U.S. Budget Deficit to Reach $1.1 Trillion in 2012. This is the fourth consecutive year the U.S. runs a trillion-dollar budget deficit. The budget office forecasts U.S. debt will total 73 percent of the nation’s GDP this year. That would be the highest level since 1950 and about twice as large as five years ago, before the most recent recession, CBO said. 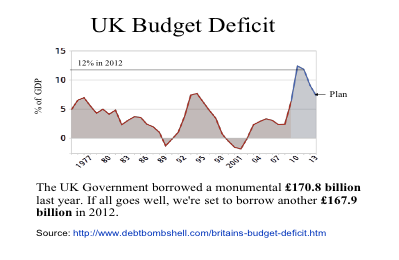 A significant amount of the budget deficits are inherited from the previous governments! Obama from Bush, Cameron from Blair, for example. A typical PPP example would be a hospital building financed and constructed by a private developer and then leased to the hospital authority. The private developer then acts as landlord, providing housekeeping and other non-medical services while the hospital itself provides medical services. 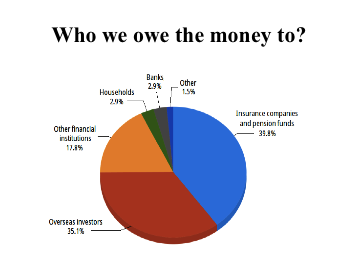 Who we owe the money to? The Government borrows by selling bonds to private investors. 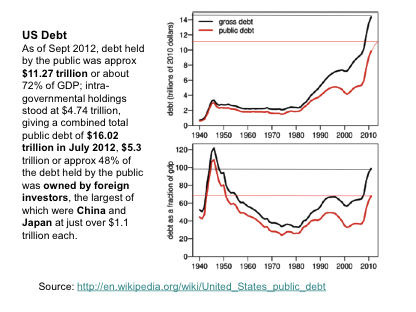 Over 35% of our debt is owed to foreign countries and corporations. As of 9:30 am today (13 October 2012): £1,063.9 Billion, or £1.06 Trillion! Interest on the national debt will cost over £42 billion this year. Debt/Def Ratio = 20 years! Safeguards should be included in Constitutions to ensure that government budget deficits and debts are maintained within specified sustainable limits, to prevent any government from buying electoral popularity by acquiring excessive loans, incurring excessive expenditure, and in effect mortgaging the nation’s future. What can we do? As the supporters of the UN, we, and our UNA friends in other countries, should urge the governments to either initiate Constitutional amendments or participate in international pacts, whereby appropriate limits and adequate verification and enforcement rules are envisaged on both budget deficits and debts.